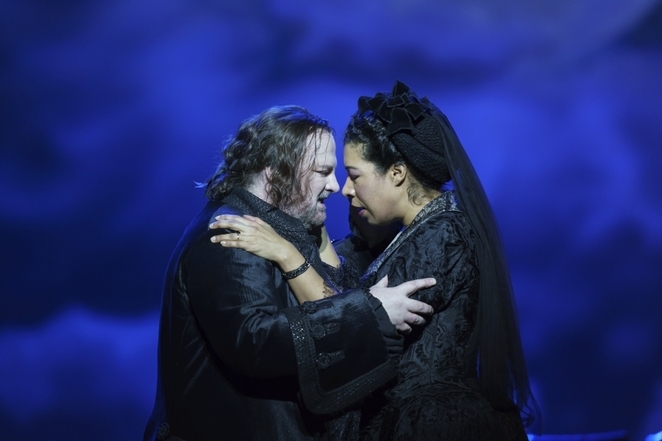 Verdi's Un ballo in maschera (A Masked Ball) is given a makeover in this new production by Welsh National Opera performed at Birmingham Hippodrome in the company's spring tour. Based on the real-life assassination of Swedish King Gustav III while at a masked ball in the theatre he commissioned, director David Pountney returns to this original story for much of his inspiration. The theatre is both the start and the end point for this. Raimund Bauer's huge set reflects the boxes in a theatre with three large moveable walls which allow the space to contract, expand and even split down the middle when required. This works really effectively at times but it does also have its limitations. When recreating the inside of a palace, mansion or the theatre itself, it focuses the scene but when the action moves to outside on a wild and fearsome midnight under the gallows, the red seats become a distraction and make it hard for the audience to visualise the real eeriness of this place. There are also times when the metaphor is so heavy-handed it becomes almost a parody of itself. When fortune-teller Ulrica warns of the assassination there's no sense of menace but, sitting on a giant seat peering down on the rest of the cast, Sara Fulgoni as Ulrica just looks uncomfortable. Furthermore, the costumes of her minions with swords and scissors sticking out of blood-splashed wounds are reminiscent of fancy dress outfits for a Halloween party rather than demonic. By the closing scene which sees the assassination of the Gustav figure, who Verdi re-imagined as a governor called Riccardo, it has all become a bit of a muddle. Riccardo, played by Gwyn Hughes Jones, isn't actually stabbed because he's swapped places with a double who takes the knife. Instead, Riccardo stands to the side reading from a book until the very final scene where everyone else drops down dead and he's the last man standing. Confused? You're not alone. The problem with all of this is that it loses the plot somewhat. While it may all look very lavish, the central love triangle between Riccardo, his best friend Renato and Renato's wife Amelia becomes a side-line to the set and its shock factor. That's not to say there aren't some very strong performances. Mary Elizabeth Williams excels as Amelia, a woman whose heart belongs to two men and who is determined to do what's right – if only she can work out what that is. Hughes Jones is a complex Riccardo leaving the audience ambivalent as to his fate. His enemies and his allies are many and we're not quite sure which camp we're in. Moving from friend to enemy is Roland Wood's Renato, a man driven to vengeance by what he believes is betrayal from his wife and friend. And Harriet Eyley gives the character of Riccardo's servant Oscar plenty of energy and life. Verdi's score is handled brilliantly by the WNO Orchestra and conductor Carlo Rizzi who bring out both is drama but also its sensitivity. 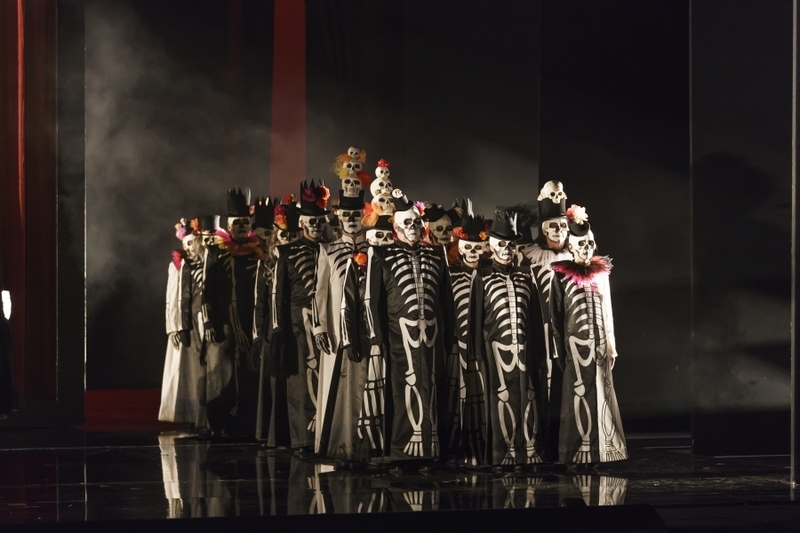 Marie-Jeanne Lecca's costumes are strongest at the masked ball when all the characters, except Riccardo, are dressed like Day of the Dead figures presaging the murder about to happen. As they fill the stage with their skeletal figures and skull faces taking up the dance, there's finally that sense that fate will come full circle, Riccardo will face his reckoning and Death will have its moment. Un ballo in maschera is performed alongside Mozart's The Magic Flute (March 7 and 9) and Donizetti's Roberto Devereux (Mar 8). See birminghamhippodrome.com for full details.